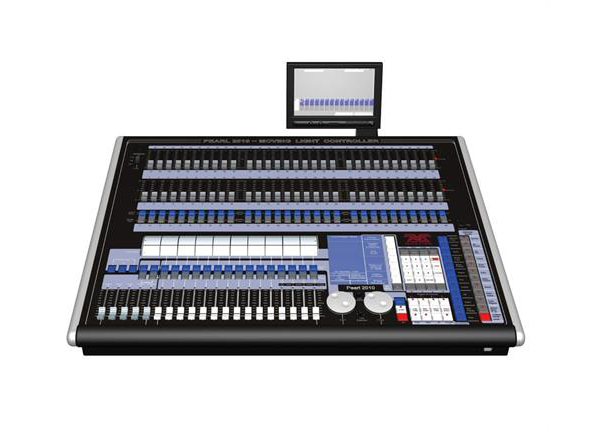 A variation of the , the 2010, sees Avolites a contemporary streamlined look for its global bestselling console. This includes new graphics and an ergonomically curved front and back, complimenting the physical aesthetics of the Expert and consoles. The 2010 is a cosmetically updated 2008 with the addition of USB memory, giving storage for the complete set of personality files as well as multiple show files. The 2010 combines compact dimensions with plenty of power, offering full moving light control for up to 240 intelligent fixtures. As with all Avolites consoles, the Pearl is designed for quick and easy programming and playback. The patching of moving lights and colour changers is also as simple as patching a dimmer. Preset Focus Palettes provide fast building blocks for functions such as pan, tilt, colour, gobo, etc. All memories and chases built from preset focuses are automatically updated once the preset focus is edited. Preset Focuses allow you to create and save your own custom palette of colours. Channels can be allocated as HTP or LTP for control of dimmers, colour changers or multi-channel fixtures, all of which can be patched with one button press. The 2010 retains the intuitive and familiar feel of the "roller", use of high quality Faders, Shadow switches and legendary reliability of Avolites consoles.